For some people at the State Department's ministerial, the stories of persecution come secondhand -- but they're no less life-changing. One of the most powerful speeches of the day came from a surprising source, Mick Mulvaney, the president's director of the Office of Management and Budget. When he got to the stage, Mulvaney joked, "You're probably wondering to yourself, 'What can the budget director bring to this discussion?'" Turns out, an awful lot. "I've never been a victim of religious persecution," he said from the outset. But he still has plenty in common with the people there: he wants to be a force for change. Five years ago, Mulvaney explained, he was invited to join a small group of lawmakers outside Rome to talk about the issues facing Catholic Christians. Back then, he said, the world was just starting to hear about ISIS. When priests began talking about the challenges they were facing, Mick (who was a congressman at the time) asked if they wanted help immigrating. He was surprised when they fired back, "That's the last thing we want -- that's what ISIS wants. They want to just remove the Christian presence from Iraq and Syria. We want to stay, we just need some help." "'We're here from ISIS. We're here to collect the tax... Last year it was $5. This year it's $500,000. Don't feel badly if you can't pay it. We're giving you two choices -- conversion or death. How do you feel about conversion?' And the whole family is standing there. If the father said no to conversion, they'd typically kill the oldest child in front of him. And then they'd wait, ask the same question again, and kill the next child, the next child, and kill the mother, and the father last. Typically, they'd do one or two houses a night. Everybody knew they were coming back the next night. That's terror. Terror isn't not knowing what's going to happen -- it's knowing what's going to happen and not knowing when." Not everyone's experience is as chilling as that. Persecution, Mick pointed out, often stops short of life and death. He remembers how shocked he was when men and women from sub-Saharan Africa came to talk to him about how our U.S. taxpayer dollars are used to "discourage Christian values in other democratic countries." "It was stunning to me that my government under the previous administration would go to folks in Africa and say, 'We know that you have a law against abortion -- but if you enforce that law, you're not going to get any of our money.' 'We know you have a law against gay marriage, but if you enforce that law, we're not going to give you any of our money.'" That's a different type of religious persecution, but it's one, as an American Christian, he never dreamed he'd see. Thankfully, a year and a half into his new administration, President Trump is writing a new chapter of real and lasting freedom. He wants to empower other nations, not blackmail them. He wants to give rise to leaders who make religious liberty a priority -- no matter what their government job may be. 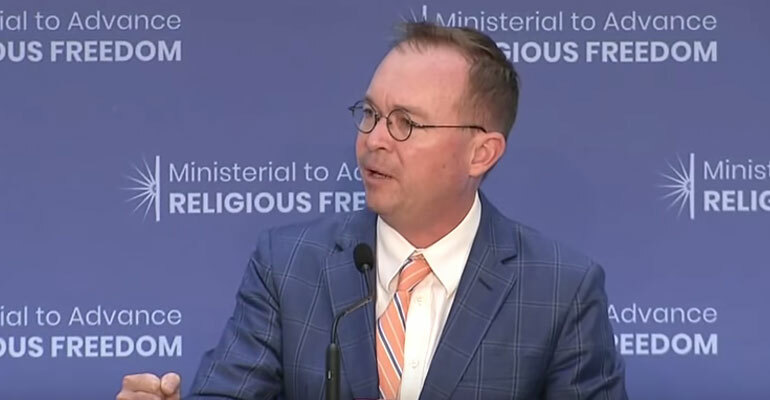 The White House's budget director may not seem like an obvious choice to speak at a conference on international persecution, but it's a meaningful statement on just how deeply this entire administration cares. "Why am I here?" Mick asked. "To let you know that there are many, many people in our government who care about the issues that you're talking about... I have two jobs [and] 2,200 people working for me -- I don't have time to do it. But I want to help." "There are a lot of people here who want to change outcomes. There are a lot of people in this government who just want to see things done differently. They want to do something... I've been talking about this for five or six years. [Congressman Jeff] Fortenberry and I have told each other we're tired of talking about stuff. I think we all know now the scope of this problem -- we're starting to grasp it. What can we do? I have no idea what the answer to that question is. But I trust Ambassador Brownback. And I'm so excited that the president actually made a commitment as part of this administration to put somebody of his credibility and his stature in a role like this."